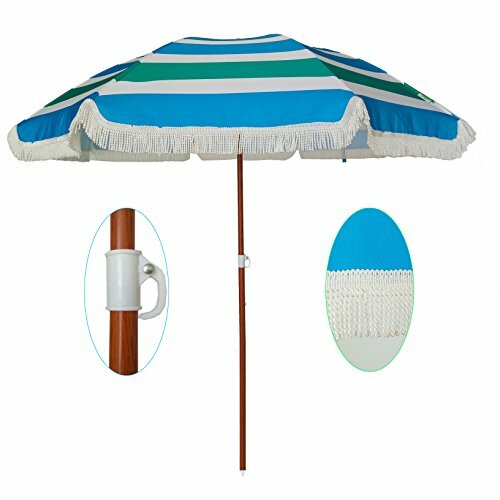 Ammsun 2018 6.0ft beach umbrella new design with combing on flap. Canopy Diameter: 6.0ft,Fabric: 160G polyester with transfer printing(stripe). Pole Diameter:0.87"/0.98"steel pole with wood color power coating.Ribs:0.15"*8 steel rib, without tilt, same material carry bag with PVC window. 1x beach umbrella 1x carry bag. 3)The umbrella is mainly used to block the sun for a leisure time at the beach, instead of keeping out the invasion of the storm, so try to avoid the relatively bad weather. One Year Manufacturer's Warranty. Or you can directly contact us, when you meet with quality problems. AMMSUN 2018 6.0ft beach umbrella new design with combing on flap.The umbrella is supported by 8 steel ribs. same material carry bag with PVC window.product weighs 4 lbs including carry bageasy to carry. If you have any questions about this product by AMMSUN, contact us by completing and submitting the form below. If you are looking for a specif part number, please include it with your message.